The Right Honourable ‘The Lord’ and ‘Lady Clitheroe’ recently hosted a choir from The Church of Jesus Christ of Latter-day Saints at an historic Remembrance Day fundraiser for a new organ at St Leonard’s Church in Downham. Staged for the sixth time outside the USA, the musical “Our Story Goes On” saw 20 actors, soloists and a 40-person local choir blend show tunes, love songs and original music in an uplifting tale of life, loss, love and the family journey. Two performances were presented to capacity audiences. At the end of the evening, Chorley Stake president Michael Gratton presented a cheque to the Hon. Ralph Assheton, warden of St Leonard’s Church, to bring the organ appeal closer to its fundraising target. The first LDS missionaries to England in 1837 quickly found converts, and organised the Preston branch in Lancashire, now the longest continually operating unit of the Church in the world. Of that group, Heber C. Kimball, Orson Hyde, Willard Richards and Joseph Fielding had some of their most spiritual missionary experiences in the nearby village of Downham. Within nine months of missionaries arriving, more than 1,000 people were baptised in England. By 1900 as many as 100,000 converts emigrated from the British Isles to strengthen the main body of Latter-day Saints in America. Thomas Emmett was one of these. A Downham blacksmith, he was baptised and emigrated to America 165 years ago. Three of his descendants were in the audience of “Our Story Goes On”. Allison Warner and two of her sisters flew from Salt Lake City, Utah to visit their ancestral home on the weekend of the performance. In an emotional speech, Ms. Warner paid tribute to the people of Downham and the Assheton family for preserving the village as it was in the 1800s. 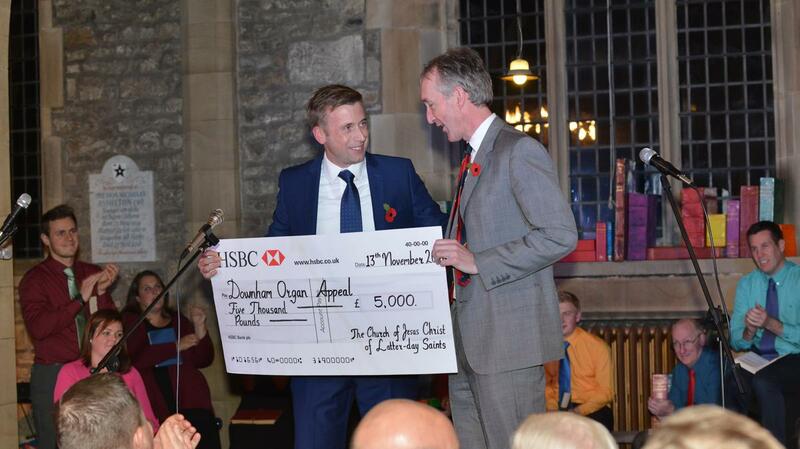 She presented a further donation to the organ appeal “from the descendants of one of Downham’s sons”. The previous day as performers rehearsed, soldiers from The Queen’s Own Yeomanry based in nearby Wigan laid their Remembrance Day poppies in Downham and visited the church. Perhaps feeling they had intruded on proceedings, they turned to leave until the ensemble stood to attention and offered an impromptu rendition of the beloved hymn “I Vow to Thee My Country”, which speaks of a Christian’s loyalty to their homeland and to the heavenly kingdom. After this year’s Remembrance Day, many may indeed recall that home and heaven became one and the same, in historic Downham.